I spoke with an ecobee tech and they pointed me to an alternative solution. If I get an adapter called a "Fast-Stat Common Maker", all I need to do is figure out where to connect the C-Wire at the furnace board and it should do the trick. So question now is: Where can I tap into this wiring setup to get my 24V C-Wire feed? We'd like to install a smart thermostat in our home which is heated by a central Wood/Electric furnace (Wood being the primary heat source). Currently, there is a group of 4 wires running from the furnace's command block to 2 thermostats on the main floor. 2 of the wires go to a simple mercury-tube thermostat which controls the dampers for the wood heat. (We keep this one at 26C so that it's always open if the fire is burning). The other 2 wires had an identical setup (with a mercury thermostat) for the electric heat source, but a few years ago we replaced it with a programmable Honeywell thermostat so that we could program the electric heat when we were away for a few days (when we obviously couldn't make fires to heat the house). I've got this one wired very basically: 1 wire to 'R' and 1 wire to 'W'. Only problem is every smart thermostat I've found requires a "C-wire" which isn't present in the current configuration. The Ecobee3 Lite comes with a Power Extender Kit, but the instructions still reference control board wiring letters that aren't present at the furnace. 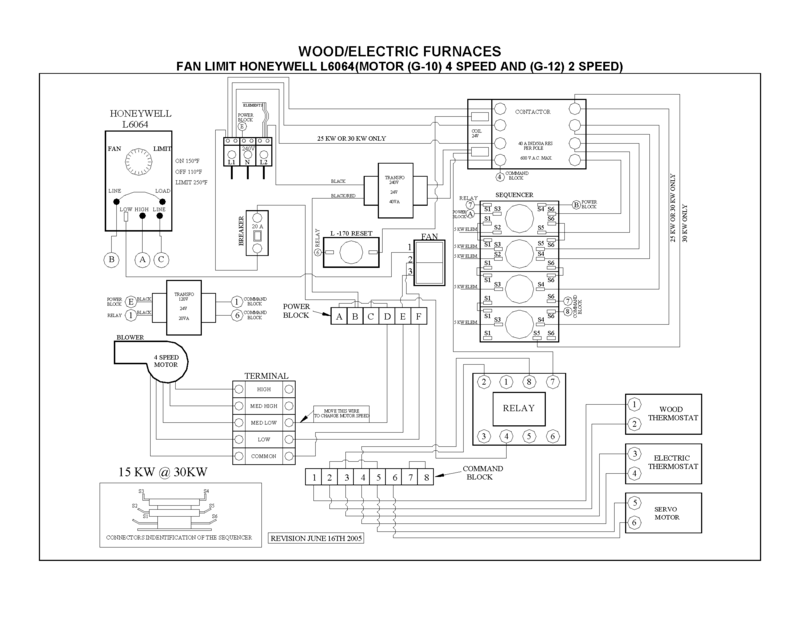 The wiring diagrams for my furnace can be found in the manual here: Page 18 or Page 23 (I'm just not sure what blower motor I have, but it's the PSG-4000 Wood/Electric Combo). Is it even possible to hook up one of these thermostats? Are there alternative thermostats that have the Wi-Fi functionality but don't require the C-Wire ? Bonus question: For the thermostat that controls the wood furnace dampers, is it ill-advised to convert that to just a simple on/off switch? Replace the 20VA 24VAC transformer with a 40VA version (40VA HVAC control transformers are utterly bog standard) and then tap C at terminal 6 on the furnace's control terminal block, using a 24VAC SPST relay to allow the thermostat to control the electric side. Tap the electric-side C terminal, likely at terminal 7 on the relay, and then use a 24VAC SPST relay to allow the thermostat to control the wood side. Something like this would suffice for this application as far as relays go (technically, it's not UL listed for standalone use, but for mounting into a furnace, that's not a big deal). New thermostat wire: maximum number of wires? Before replacing a thermostat, is it enough to unplug the furnace?